Does the Gallagher family get it together during the eighth season of the Shameless TV show on Showtime? As we all know, the Nielsen ratings typically play a big role in determining whether a TV show like Shameless is cancelled or renewed for season nine. Unfortunately, most of us do not live in Nielsen households. Because many viewers feel frustration when their viewing habits and opinions aren’t considered, we’d like to offer you the chance to rate all the Shameless season eight episodes here. A Showtime remake of the dark British dramedy, Shameless stars William H. Macy as Frank Gallagher, a neglectful, alcoholic father of six. His resilient, self-reliant kids scramble to survive without Frank’s guidance. 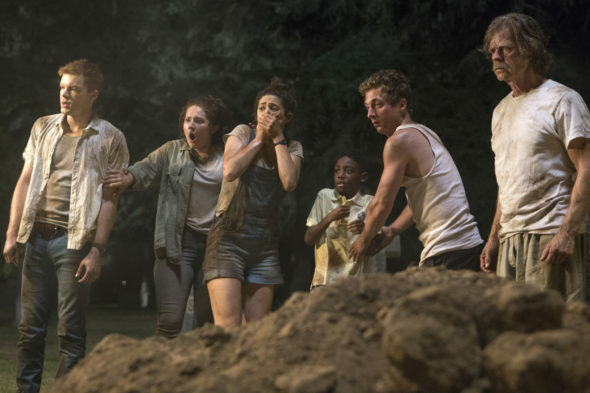 The cast also includes Emmy Rossum, Ethan Cutkosky, Shanola Hamptom, Jeremy Allen White, Steve Howey, Emma Kenney, Cameron Monaghan, Isidora Goreshter, and Christian Isaiah. This year, recurring guest stars include Jessica Szohr, Faran Tahir, Elliot Fletcher, and Scott Michael Campbell. Showtime renewed Shameless for a ninth season, just days after the season eight premiere (details here). In Shameless, season eight, Franks lays off the drugs and decides to work for a living. Meanwhile, Fiona (Rossum) realizes her success as a landlord comes at a price for others. As Lip (White) struggles with sobriety’s sacrifices, Ian (Monaghan) wants to win back Trevor (Fletcher), and Debbie (Kenney) juggles single motherhood with work and welding school. After losing his scholarship, Carl (Cutkosky) has to find another way to finance his tuition, while Liam (Isaiah) starts to understand how different his family is from those of his schoolmates. In addition, Kev (Howey) and V (Hampton) look for a way to handle things with Svetlana (Goreshter), after she swipes their bar, The Alibi. What do you think? Which season eight episodes of the Shameless TV series do you rate as wonderful, terrible, or somewhere between? If it were up to you, would Showtime have cancelled or renewed Shameless for a ninth season? Don’t forget to vote, and share your thoughts, below. More about: Shameless, Shameless: canceled or renewed? Shameless: Is the Showtime TV Series Cancelled or Renewed for Season Nine?